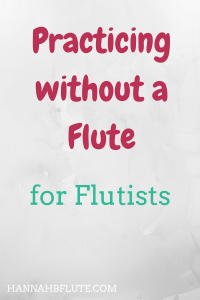 After coming down with a cold recently, I thought it would be the perfect time to write about practicing flute without your flute. There are multiple reasons why you might need to do this. If you’re sick, if your flute is in the shop, or even if a roommate or family member needs quiet, you may need to find other ways to “practice” than simply picking up your instrument. These ideas are not the same as playing your instrument, but they can help you improve your skills. At the very least, you can learn a little bit more about your instrument. Disclaimer: This post contains affiliate links. Click here for my full disclosure policy. I have mentioned this before, but you can learn a lot about music from listening to some recordings. If you are learning a new piece of music, recordings will give you a sense of the tempo and the feel of the piece. You can also listen to recordings after you have learned a piece. This will help you figure out how others interpret the music. You can then create your own unique version of the piece. If you are playing an arrangement (i.e. a piece not written originally for your instrument), you can listen to recordings on the original instrument. This will give you a good idea as to how the composer wanted the piece to sound. Each instrument does have its own quirks after all. If you can’t practice your instrument, you can learn about it. Get on YouTube or social media and watch videos or read blogs. The internet is a great place to learn about music. A lot of videos and blogs are free to use, and there are some premium sites where you can spend a bit of money for more specialized content. I am working on premium content, and I hope to release some of it early next year. However, there are tons of great websites where you can learn about music and the flute. This blog is, of course, one of those resources. I also have a ton of other favorites that I wrote about awhile back. Whether you are working on a solo piece or an ensemble work, you can study the score. I wrote a whole post on how to get started with score study, so use those tips to help. Studying a music score allows you to know what other players are doing. You can compare the different parts to your own. This means you can change how you play a certain phrase based on what else is happening. I don’t study scores as much as I should, but when I do, I am able to make more educated decisions for tempo, articulation, and dynamics. Score study also tells me where I am in a chord. Am I the root? The third? The fifth? If you are fairly new to your instrument, or even if you have been playing for years, you can always study up on music theory. Music theory (and ear training) is at the core of music. You need to have a working knowledge of music theory to know how music works. Solid ear training also helps you “hear” a phrase or piece before playing. You can check out music theory books or download an ear training app to your phone. With a book or app, you can practice in the comfort of your own bed, even when you’re super sick. This tip doesn’t exactly relate to flute playing or to practicing without your flute. It does, however, help you get back to flute playing sooner rather than later. Winter is approaching, and that means so is cold and flu season. If at all possible, don’t be afraid to take a few days off from the flute. If you’re really sick, you want to recover. Playing while sick isn’t productive. Heck, sometimes music study isn’t even productive when you’re sick. So listen to your body and know when you should take a break. Sometimes it is more important to sleep than to prepare for you next performance. I have had to perform while sick…twice. And it wasn’t fun. I got through it, but I didn’t push myself. As soon as the performance was over, I left. I went to sleep. I rested. Your health is important. Don’t let a performance or practice session impede your recovery. Have you played flute while sick? Were you able to take time off to get better? Let me know in the comments! And be sure to subscribe below for access to freebies and updates! Nice tips to follow. It is also useful for beginners.